Doncaster Rovers have signed defender George Friend following his release from Wolverhampton Wanderers. The 22-year-old has penned a two-year contract at the Keepmoat Stadium to become manager Sean O'Driscoll's first signing of the summer. Friend told the Rovers website: "Doncaster are a nice Championship club and I am happy to be here. "I wasn't getting many games at Wolves and now I hope I can come here and play regular games in the Championship." 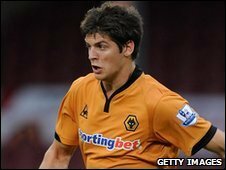 Friend made just eight appearances for Wolves after moving to Molineux from Exeter City in September 2008. He has had spells on loan with Millwall, Southend and Scunthorpe as well as returning to Exeter at the end of last season. "Doncaster is a great club with good coaching staff," added Friend. "Everything is done properly and I am very excited. "I love to play football and Doncaster certainly do that well. I want to forward with this club and we have seen from Blackpool that anything is possible in football."